Kaeck (an older Dutch word for jaw) is a Dutch black metal band containing members of Sammath (Jan Kruitwagen, now Chaos, guitar), Kjeld/Tarnkappe/Asregen/Lugubre (Swerc, now Agitator, drums, synths, bass) and the singer of Noorderlingen here called Oovenmeester. Their debut album Stormkult is written and recorded in only seven weeks: is this maybe too hasty or has it gone well? It has gone well, because the rough songwriting and production fit together. This wouldn’t have worked with something fancy like Dimmu Borgir or Cradle Of Filth, but it sure works with Kaeck. They breathe the spirit of old black metal, nothing too new, nothing too technical, but plain black metal like it was played in the nineties, up north by bands like Darkthrone. Fast drums with too much and low produced kick sound here, production could be better but fits with the raw songs. The lyrics are in the original language (Dutch) but I’m not aware of its content with just a promo copy. Stormkult had to conquer my fear of repeating this 90’s black metal sound without really showing something of one’s self. But since Kaeck is black war metal, as called by themselves, they had to conquer – or die trying. And after the first listening it is already clear that it’s no copy of these 90’s black metal bands, but an own output with identity and intensity. Raw guitars, raw drums, raw vocals, about everything is there as expected. But there’s also synth playing sometimes. That’s not something to expect, within raw black metal synth usually isn’t present. I had troubles to get into Kaeck’s release exactly because of the use of synth with this traditional raw style. But in the end it turned out I only have problems with the synth in the first song, maybe it could have sounded evil instead of rather happy, when it was an octave lower or so. It’s catchy though, this tune, but in the other songs the synth adds atmosphere. Guitar is quite hard to distinguish, not in volume but what riffs are exactly played. It’s a bit of a fuzz under the loud vocals and drumming, which doesn’t satisfy me completely. Being a guitarist myself I’m much focused on the clarity of the riffs. Not saying it should be polished, but a bit more defined might be better for the sound. I’m not sure if the production/mix is to blame or if its intentional. This lack of clarity in the guitar riffing is no real problem because it’s the total picture that counts. And that’s a raw storm of black metal without much clear melody except for the synth parts. So that’s an important instrument on this release. No wonder that a basic structure is laid by Swerc who does the drum and synth of all the songs before Chaos adds his guitar riffs which are atmospheric aggressive. Their record is primitive, but an effective output both in time and talent. Its raw energy is palpable. This is not for weak ears. Kaeck is for fans of the earlier black metal bands and the ones that still make this sort of raw, retro records. Really no references come to my mind and that’s a good thing. Kaeck has got an own style, sounding different than others while not breaking into new territories either. 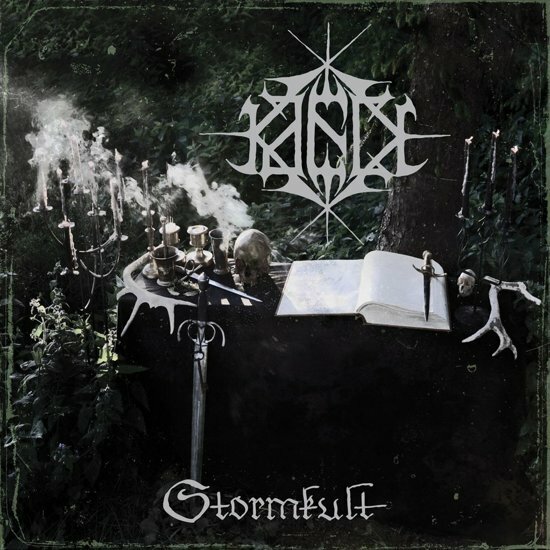 Stormkult is the kind of release that won’t please experimental minded people, yet possibly shall please a lot of traditional black metal people and maybe new ones who also feel for tradition. Like the band the singer has got identity and intensity too. Powerful screaming, sometimes more or less clean singing, always in a raw and energetic manner. Together these three musicians have made something that’s enjoyable; especially for a seven weeks ritual, very well done! This summoning of busy black metal people is not storm in a glass of water, yet a storm in the Dutch black metal scene. It could be lasting longer this band… Maybe, this is not the final record of Kaeck? Also their Folter Records CD could be a little longer lasting since a meagre 33 minutes is in my ears too short a time. The Dutch scene is connected through many musicians who are in more than one band, most of the times. Where such links can lead to in short time spans is clear with Kaeck’s fine Stormkult release.